This is for everything Taco Bell. We have countless threads on the subeject. Covering everything from Ryan's choice and everything new on the menu. THis is the place for TACO BELL!!! Is it even possible to merge all the other threads to this one? Ms. Skanky ain't down, and there's not one all that close when I'm home alone. just picked up 3 soft on my way home from errands. you know you haven't been to taco bell in a long time when they've changed the taco wrapper. I share a love for Taco Bell that it seems several members of the board do as well. The one near me still makes Grande Soft Tacos even though its not on the menu. I go for 2 of those and a Meximelt usually. 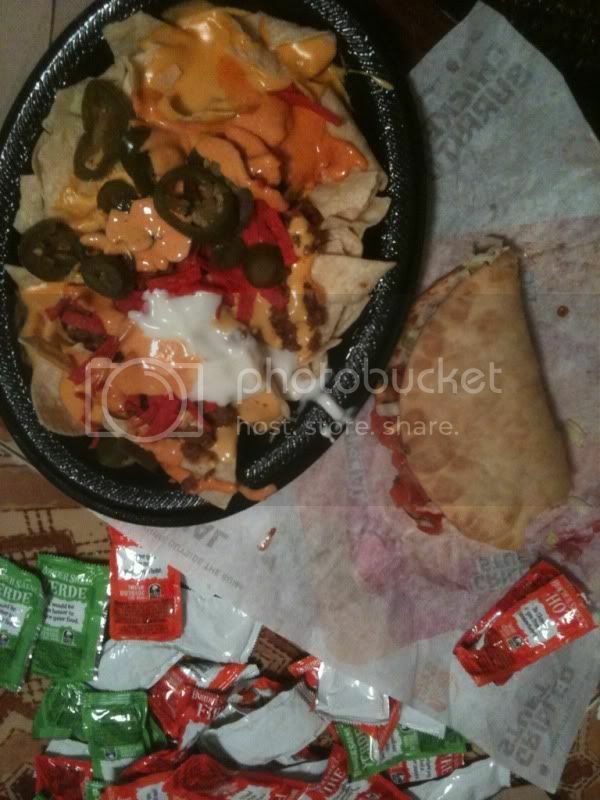 I really can't get enough of the nacho cheese there, what is a good item that has a lot of it on it? I must try this 'cheesy gordita crunch'. The name intrigues me. the last time I ate there was with you oh gawd. Also, Baja Blast is where it's at. I wish they sold that outside of the Bell. It's usually an off menu order. It comes around every once in awhile. Best item they sell hands down. Just had one; it gets a thumbs up. Good crunch to chewy ratio, definite cheesiness and glorious beef. Some nacho sauce could have put it in the astronomical status. Is it mostly nacho cheese weight? Just the thought of Taco Bell begins a 30 minute process where I think of how good it is, but how I don't want to get in the car and drive all the way to it, how I need to stop spending so much on food, and what I'm going to order when I get there. I need to plunder my local Taco Bell fairly soon. My supply of hot sauce is at an all time low and at the rate in which I use it I am in fear of running out. Can't let that happen. I had it yesterday and actually must say I was impressed. a flatbread sandwich has no place in taco bell. what's next a taco ciabatta? or pork masitas on a baguette with a side of extra hot taco sauce.